A couple of weeks ago when we showed the pictures from our Tailoring Symposium at Pitti, a reader asked if there were any images of Wei Koh’s suit. I had mentioned that the founder of The Rake was wearing a Rubinacci-made number in the same Scabal linen as my Sastreria Langa. Here a couple, from the poolside discussion and the group shot afterwards. Obviously Wei’s style is not mine, but the fit and finish of the suit were excellent. You can follow the discussion on Rubinacci linen suit – on Wei by entering your email address in the box below. You will then receive an email every time a new comment is added. These will also contain a link to a page where you can stop the alerts, and remove all of your related data from the site. Don Johnson just called; he wants the eighties and that suit back! On a serious note, I cannot understand why you would wear tailoring in that manner: extreme sprezz I assume? There’s nothing wrong with the suit, it’s just how he wears it. There’s no sprezz, he just is doing whatever he can to make sure he looks bad. But it’s a really nice and interesting suit. I just wish he wore it better. An outfit like that is almost a deliberate insult to a nice suit and to those of us who appreciate a suit like that but could never afford it. T-shirt, bracelets, necklace, tennis shoes….really? Oh dear, oh dear – what a sight. He may as well have turned up in jeans, T shirt and trainers – oh its nearly that anyway. I’m a huge admirer of Wei Koh and his magazine. I get the impression that The Rake is trying to encourage young casual dressers to wear suits, but in a less formal way. I’m not convinced that The Rake can do that. The young take their cues from the High Street and youth culture. I dislike suits with t-shirts and trainers. Such an outfit certainly seems incongruous for this particular occasion. Still, such an esteemed man needs no advice from me. All I would say is that, at a time when the world is losing its way in manners and style, I , for one, believe that those who still appreciate style and manners should not give up now. Wei beautifully decries formality in restaurants and in dress (issue 41). Yes? People will wear pyjamas and pick their noses in fine restaurants if we let them. Going to a smart restaurant in shorts and flip flops is an insult to staff and diners alike. I like rules and standards. They are the very thing that save us from our awful selves! I know i shouldn’t but i like Mr. Wei’s ensemble here. Ok, maybe substitute the trainers for espradrilles/ loafers etc. Linen is neither conservative nor for business so let him be. My only gripe really is the 1-button cut ( a cut i don’t care for) but that is a stylistic preference. Well, the cigar feels a perfect accessory for that cloth, if everything else is off-key! I always think the collar of jackets worn this way must get dirty very quickly. A shirt collar seems primarily functional, given it’s so much more practical to clean. I like Mac’s comment especially the latter part but wonder whether Wei’s suit would have been more acceptable in its proper context; somewhere sunny, by the beach, perhaps on The Riviera/Italian South. Its cut, colour and cloth and more importantly its intent as a garment would then be more in its natural environment. I agree with what Simon stated as well as the others, definitely not permanent style ‘style’ and its smacks of high (low) street influences. The suit is great. I wouldn’t wear it with those accessories or in this style though. Thanks for this post. The prompted comments coming from regular PS readers do not surprise me at all. I completly agree with Mac. There is a teaching moment going on here, which in turn should lead to a kind of action. I think you should see about how to organize an evening event or whatever and invite Bruce Boyer and Drake for a conversation on “style and occasion”. If there is a single issue really worth exploring, then it may well be this one. You would do a great service, if you managed to plan such an event. Then a video, podcast or transcript for PS readers would be hugely helpful ! I just took a look at the post on the Langa suit that Simon refers to. The shirt and tie and ‘proper’ shoes serve as a counterpoint to the similar levels of creasing and the slightly looser fit that you get with linen that each of these suits / looks has. 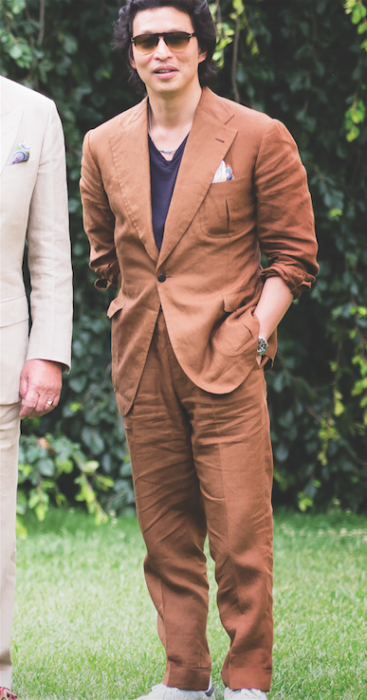 In Wei’s case there is nothing to detract from the creased and slightly dishevelled look of linen. As a result it does not quite make it for me. If the T shirt were white and had a better fit, especially at the neckline, and the sleeves hadn’t been scrunched up I reckon we’d have more proponents of Wei’s formal casual idea commenting here. I think Mr Koh is simply wearing another type of look here. Yes the outfit involves tailoring, but it doesn’t mean it has to be smart (although tailoring and smartness go hand in hand 99% of the time). 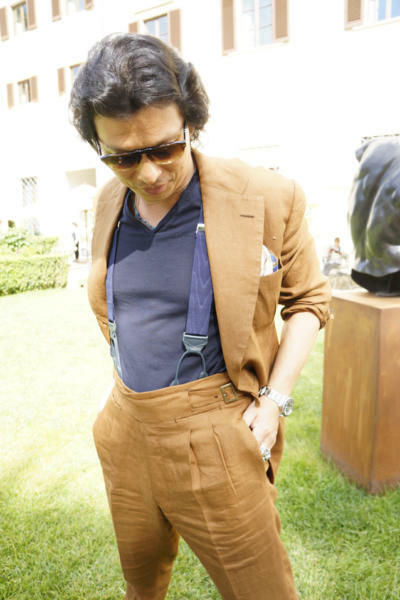 Although I personally wouldn’t/don’t dress like this, I imagine that a lot of people would struggle to wear tailoring in the non-smart manner Mr Koh is doing here. Horses for courses. I think Mr. Koh, like most people, is also struggling here. Agreed Nigel. I know Wei has tons of style but this outfit just looks so disheveled! Such a shame with such a lovely suit. Perhaps it could work with espadrilles and a popover shirt…? Mr. Koh, please dress appropriately going forward. Wearing that wonderful suit in that manner is quiet frankly inexplicable. You are not a rapper or football player so, please leave the bracelets, chains,trainers and TEE-SHIRT at home when wearing something as fine as a Rubinacci linen suit! Thank you in advance for you cooperation in this matter. I personally hate the massive lapels, there’s nothing to counteract their weight, which coupled with linen and heavy creasing creates an oversized effect which is really an insult to the amount of hours put into the suit. The guy looks like he commissioned something he actually wanted, and wore it in a way he wanted. Bespoke is about expressing an individual sense of style. On that basis, i cheer him on! Also happen to think it works – he looks comf0rtable and like he’s enjoying himself. What more is necessary? One can be comfortable and enjoy himself in his pajamas – that doesn’t mean he should wear pajamas at a formal occasion. Actually, in dressing casually and individually the great man perhaps showed a lack of solidarity with the collective tailors who were assembled at the behest of PS and The Rake to showcase bespoke formal wear. I understand the mainstream press were there to be won over and educated on the subleties of house styles and cuts. 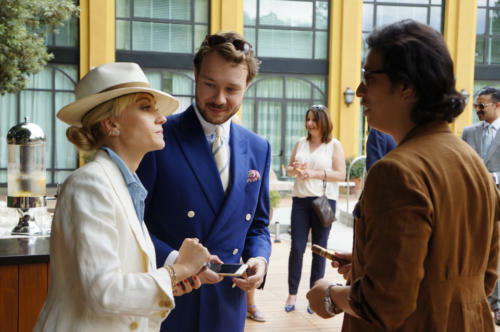 What an opportunity to show what English, French and Italian tailors do best? The tailors looked splendid. The wonderful Wei knows how to dress elegantly. The only thing I can disagree with is where and when he wore this ensemble. Apologies to Wei! This is not an attack on him. Just an observation on the art of dressing to suit an occasion. Lewis Hamilton hopefully learnt something in being barred from the Royal Box at Wimbledon earlier this year. 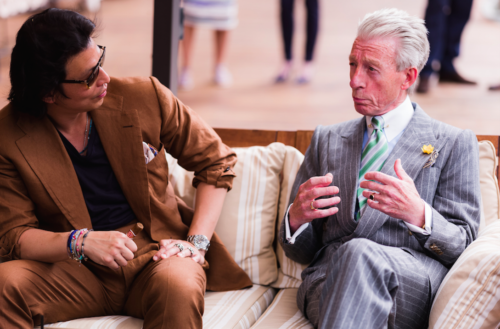 An international tailors’ summit is not an everyday chore. Nor is being in the presence of Royalty. Dress accordingly. I often see similary suits in ZARA windows. Regardless of how appropriate it was for the occasion, I think it looks terrible. The balance, proportion and general fit do, as has been mentioned above, make it look mass market high street, even if the buttonholes are by hand and the sleeves eased in. Well said Mac! Wei obviously knows how to dress well, and I even liked some of the outfits in his “Casual Formal” article, but this one was a rare miss. If Johnny Mathis, Don Ho and Bruno Mars had a baby…and Eddie Van Halen styled that baby – it would wear this ensemble. Proudly. I love The Rake (it’s the second best magazine after Monocle), but I was taken aback by their “skateboard” layout (20 pages of skateboarders wearing high fashion). All that’s missing here is the skateboard. I am not convinced that it fits at all well. Indeed, it is scrunched at the bottom of the leg and the jacket has material coming together all across the back. As one reader has earlier commented, you can obtain this look for a tenth of the price at your local Zara. Does anybody actually WANT to look like the models in this article? Mon Dieu, I think Mr.Koh has seriously lost the plot with this one. This is invariably what happens when somebody tries way too hard or is in the midst of some ill advised mid life crisis. Permenant style it most certainly is not and I have to say that recent ‘Rake’ issues have also been fare from impressive. Thanks for the post. I think his style suits him a lot. I understand what he’s trying to do with casual wear, elevating them so that you get great quality tailored garments that would look good with sneakers. It might even be his ‘uniform’. I Think your same fabric suit looks better. Congratullations. That waste of good bespoke! I´d say its an ok look, if one is a teenager. For a grown man, not so much. Choose street style or tailoring. I personally enjoy a casual approach to tailoring, making it wearable on many occasions. But if one wants to wear a t-shirt, then use a jacket or cardigan on top of it. Suits should be worn with shirts to maintain the line of symmetry. Have no idea who this bloke is and what he represents, so perhaps I am not entitled to comment. But I will. Nothing in those photos tell me this man dresses well. Awful is too mild a description. Plus he needs a hair cut. Hi Simon, What’s your opinion on lined linen and cotton jackets. It seems to me that the benefits of a lighter fabric would be lost with a full lining. Hi Simon, Unless I’m missing something your reply on the BTBA post just asked me to ask the question on a more relevant post. This is why I asked again of a post related to linen. Sorry, you’re right my mistake. Out of interest, what would be your choice of footwear with such an ensemble? I also assume you would wear a collared shirt or at least a polo.